Gideon reminds us that God gives us the gift of freedom to choose what we want to do. However, when we make mistakes, God is there and does not abandon us. The Lord said to Gideon, "You have too many men for me to deliver Midian into their hands. In order that Israel may not boast against me that her own strength has saved her, announce now to the people, 'Anyone who trembles with fear may turn back and leave Mount Gilead.' " So twenty-two thousand men left, while ten thousand remained. But the Lord said to Gideon, "There are still too many men. Take them down to the water, and I will sift them for you there. If I say, 'This one shall go with you', he shall go; but if I say, 'This one shall not go with you', he shall not go." So Gideon took the men down to the water. There the Lord told him, "Separate those who lap the water with their tongues like a dog from those who kneel down to drink." Three hundred men lapped with their hands to their mouths. All the rest got down on their knees to drink. The Lord said to Gideon, "With the three hundred men that lapped I will save and give the Midianites into your hands." 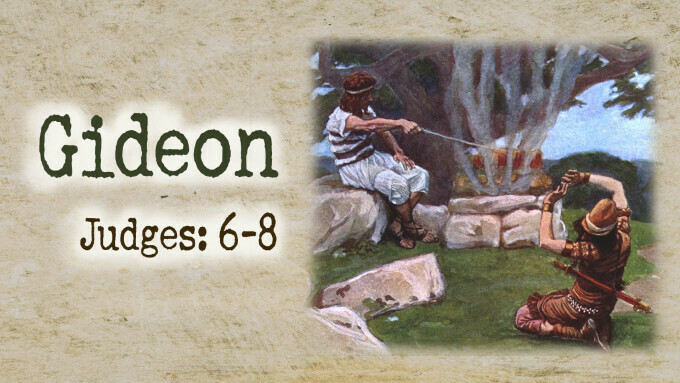 Well, you don't have to read too far into the full text of Judges 6-8 to realize that Gideon seemed to find himself, as my grandmother might say, "in quite a fix". After the Israelites had done evil in the eyes of the Lord, He had given them into the oppressive hands of The Midianites (Judges 6:1-2) When the Israelites finally cried out to God for help, He came to Gideon to command him to deliver His people. By his own admission, Gideon seemed an unlikely hero. He was the smallest of his family in the weakest of clans. (Judges 6:13) So when the Lord calls him to deliver Israel from the Midianites he's already confused. At least, he must have thought, as he looked at his army of 30,000, there might be some strength in numbers. But then, the Lord tells Gideon that he has too many men, taking him down by 20,000 and then by quite a few more, thus leaving him a band of 300 men with whom he is to fight an army of 135,000. I don't know about you, but if the Lord told me I was up against those numbers I might have turned to Him with a bold, but very respectful, "Say what?" I pondered what the Lord wanted to teach me with this story today for quite some time and to be sure, there's a lot to learn here, but for some reason, I kept focusing on those numbers. These days to be considered a success there is much focus on building a large audience. We look out into a world that is full of people striving to do and be "big". We have a society that is obsessed with numbers. The more the better - whether it's the number of views on a website, the number of members of a congregation, the number of followers on a Twitter page, the number of "likes" on a Facebook post, the number of awards, etc. We imagine that these arbitrary numbers make us stronger, more important and more valuable. And yet, the story of Gideon tells us something wholly different. God calls each of us to some purpose and I believe that for all of us the ultimate goal is to point people to Jesus. Through our human perspective our specific call might seem big or it might seem small. No matter how we measure it, if God has called us we can be sure it's important. If you're me though, your next argument might be that if this call I think I heard is important, well, He's just called the wrong gal. No matter how we measure it, if God has called us we can be sure it's important. I might argue with the Lord that I'm not enough. I don't have the skill or the personality, the most influence or the greatest number of supporters. And yet, God showed Gideon that really the only thing He needed was His faith and trust in the Lord and a few good men. Strength is not necessarily found in numbers. In actuality the truest, most formidable strength is found in the one and only God. He will give us exactly the stats we need to fulfill His purposes. His metrics are right every single time and His power is made perfect in our weakness. He was enough for Gideon and He is enough for us. Holy Lord. You are the one true power - the only one in whom we need to trust. Help us to believe that You will give us whatever we need to answer Your call - whether it is an army of thousands or a few faithful friends. Let us know that You will deliver the unlikely victory for us, just as you did for Gideon, if we remember we must only trust in You and Your provision.